So who is this 'they that put her on a train? The Order? OpAphid? What train? Canaries are meant to sing - seen and heard, not die in a darkened mine. Bree died in a place that was pretty dark. But instead M made her seen and heard with her 'Who Remembers LG15' video. I'm thinking that maybe we missed hidden files in canary.jpg? It is 809kb which is huge for a image that only has text. I'm stumped about what the password could be. 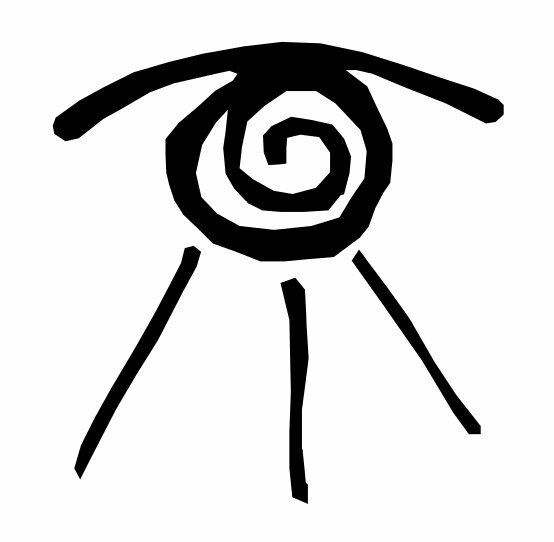 I also made a B/W image of the Spiral Eye - first thought is that it's the All Seeing Eye but all of the images I've seen of it doesn't have the spiral inside. After a little digging Daniel and Bree went hiking a lot. Another place it could be is Topanga Canyon where the fake ceremony was held. When they stop around 0:30 there is a dam in the background. Topanga Canyon has a dam called Rindge Dam. Edit: Found it! It's Morris Dam - Which is a part of the San Gabriel River. So Daniel is referring to the Swimming! video. Where is the file at? I don't like this way of using "lonelygirl15" as a stand-in for Bree's name, the way they sort of did with "I Can't Get Away From lonelygirl15". (Though that one was more of an "I can't get away from this whole thing".) It feels very impersonal and unnatural and it doesn't seem like the way Daniel would title his videos/refer to Bree. I don't know what to make of the part about Canaries. My thought was that Canary was Emma, and this doesn't seem to contradict or confirm that. "They are meant to be seen and heard, not to die in a darkened mine" could refer to any Ceremony Girl. They are meant to live, not to die. "The doctor" part, I'm not sure who it's supposed to be referring to. We've heard about a lot of doctors. My first thought was Seth Grant, and the "never had a residency" seems to support it being Spencer. I knew we were going to the "Swimming" spot. Man, it looks different. I'm glad we got some laughs on the way, cause I had feelings. (Even Emma calling Daniel a dork gave me some feels. I'm a soft touch, okay?) It breaks my heart that Daniel thinks about that being the last place they were really happy. It was so long ago, and they were so young. I'm SO HAPPY that Daniel actually sorta remembers Cassie! I really feel like we're gonna get some answers, you guys! Although it's kind of weird to realize that he hasn't been obsessing about it for a decade like the rest of us have. It makes sense, because why would they think it was important, and why would he want to rewatch all those old videos, but Cassie's such a big part of the fandom and fanon mythology that it's easy for me to forget how small her place in actual canon is. Wait, Emma didn't know that Daniel had a crush on Bree? That's ancient history. GET ON BOARD, GIRL. Finally we're talking about the Bree video again. I really thought that would be a much more urgent thing, and kind of expected them to just get their butts in gear and try to find and rescue her. But I understand their skepticism, and why they might be hesitant to believe it. I just hope we get some real movement on it soon. Is Seth Grant the doctor who was questioned by police? That is who I think it is. I definitely feel like Canary is Emma. The Game of Thrones reference, coming from Europe... It all points to her. I am not offended by Daniel calling her LG15. He probably needs to create a little distance for himself. Yep, Seth Grant was the one that the cops pulled in to question about his medical shenanigans. I wouldn't say I'm offended by it. It just doesn't feel right somehow. It feels more like an OOC choice that the Powers That Be make than something Daniel does, if that makes sense. So, I guess M really didn't leave any clues etc in this vid. Wondering what we still need to reflect on? Have we missed something, or just a way of asking for more time. There have been rumors flying in Slack and IRC that Seth Grant is a pseudonym for Spencer Gilman. Both start with SG. What video was the Seth Grant transcript with? I want to reread it with Spencer's voice. It is curious that M hasn't mentioned Spencer at all. That stuff about the doctor not having a residency and not wanting friends definitely sounds like Spencer. Better than a high school reunion!! Thank you. Seth Grant's birthday is 1985. Spencer is approximately 31. This is really sounding like Spencer. Spencer was my first thought too.